Some India customers came to our company on April 17th 2016, they mainly wanted to inspect and purchase orange juice processing line, and we supplied some oranges to test our machinery of the orange juice processing line. India customers were satisfied with our peeling and extracting machine by trial production and comprehensive evaluation. 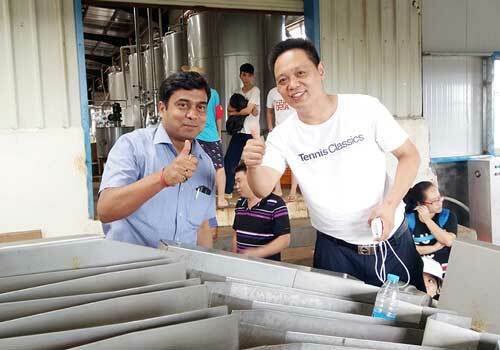 What’s more, they were quite satisfied with our fruit juice processing technology. Finally, they agreed to order our orange juice processing line immediately. Our company adheres to take the market as the guidance and concentrate on research and development for all sorts of fruit juice machineries. We have more than 300 professional staff in TICO, they work in different operating posts, provide high quality services including a variety of fruit juice machineries, technical skills, plane designs, installation and commissioning as well as staff-training for more than 150 countries from Europe, Middle East, Africa, South America, Central Asia and southeast Asia etc. Now TICO is developed to the most competitive kinds of fruit juice processing line and machineries supplier in China. We have our own workshop which covers more than 8,000㎡. The production line contains orange juice processing line, mango juice processing line, pineapple juice processing line, and so on, simultaneously, we supply machinery such as orange essential oil extraction machine, hydraulic vertical juicing press machine, etc. You can choose the best one according to your requirements.